M and I celebrated nine years of marriage bliss in August this year. We absolutely love steakhouses, especially those at the local Indian reservation casinos. We also enjoy going to steakhouses on our anniversary because steak is one of my favorite foods, and is considered a special treat. We have not tried the Grove Steakhouse at the Viejas Casino & Resort in Alpine, so we were pretty excited to go. The Grove is located near where the buffet used to be in the non-smoking area of the casino. There is a small check in stand where one host/hostess stays behind. She led us in to a small door on the left through the dining room. We were started off with a complimentary sliced baguette and different spreads. 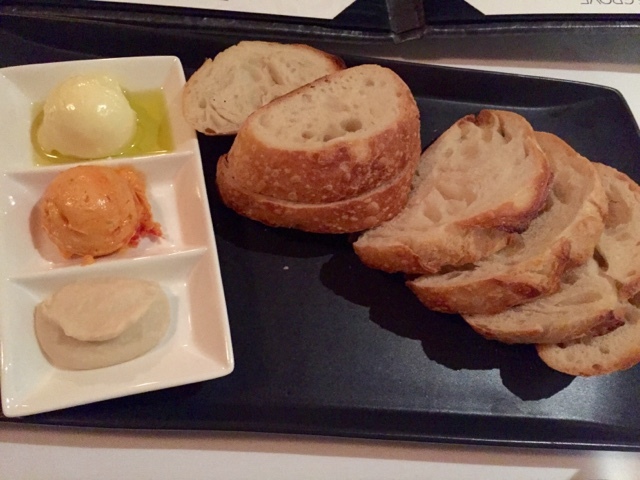 From the top to the bottom, salted butter with olive oil, sun dried tomato spread, and pureed white bean. All spreads were delicious and were a great start to the meal. 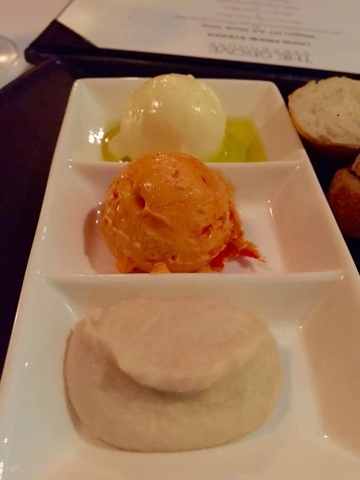 The white bean reminded me of a hummus. They sure were a nice surprise with the bread, as opposed to those cold small packs of butter. 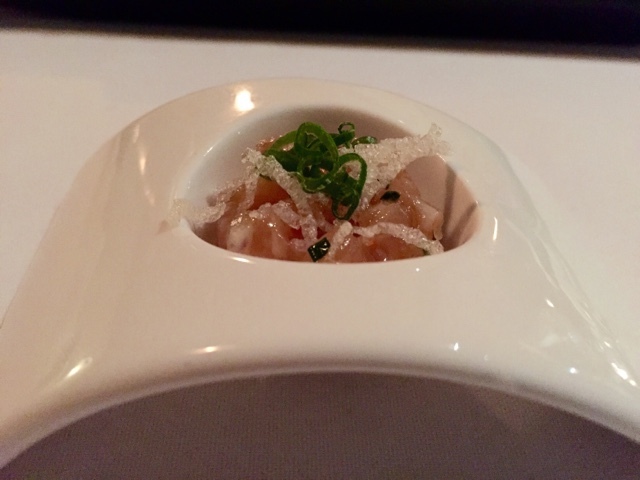 Executive Chef Yadira Perez brought us an amuse bouche consisting of salmon tartare. It was a perfect, fresh bite. Our server told us that they were all excited to have Chef Perez in the kitchen, as she started earlier this year. Next, as a palate cleanser to get ready for our delicious entrees, we each received a tiny dish of lemon sorbet with a raspberry coulis. Yum! M does not eat red meat. 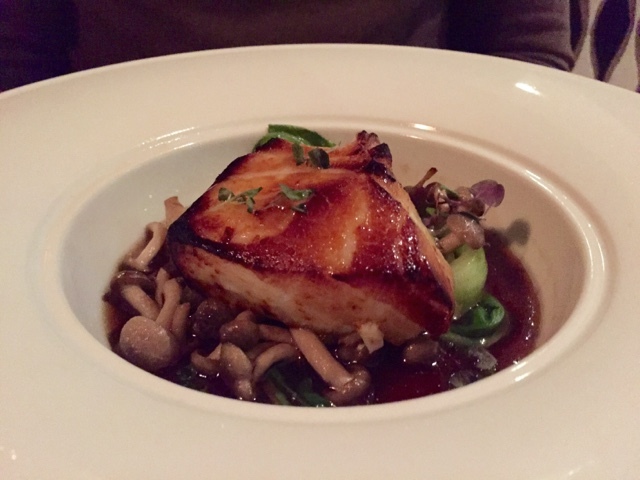 His go-to dish is the Chilean Sea Bass ($35.00) whenever we go out. The succulent fish was served with enoki mushrooms, bok choy in a soy broth. The fish just melted in my mouth. For the first time ever, I did not want a big ol' rib eye steak, my absolute favorite cut of steak. I love, LOVE steak. 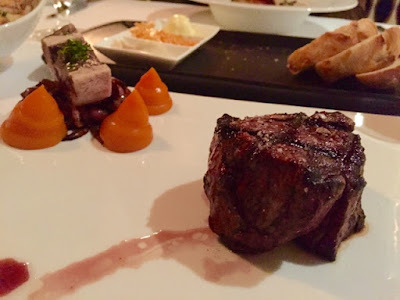 Instead, I ordered the 6 ounce petite filet mignon ($28.00). It was cooked to a perfection (medium temperature) and it was impressively delicious. The filet came with a carrot puree, caramelized onions and a garnish of bone marrow, which I tried, but could not eat (boo, guess it truly was for garnish, haha). 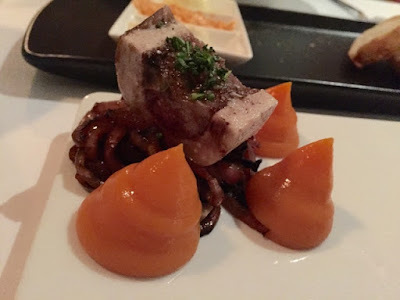 The carrot puree was sweet and, yup, tasted like carrot, which is not my favorite thing. The onions were a perfect, crispy accompaniment to every bite of my filet. Steak frites (aka steak and french fries) is my favorite dish ever, so I had to order the truffle pomme frites ($7.00) to eat with my filet. They were crispy and light. The truffle oil was just a perfect touch and did not overpower the taste of the fry. 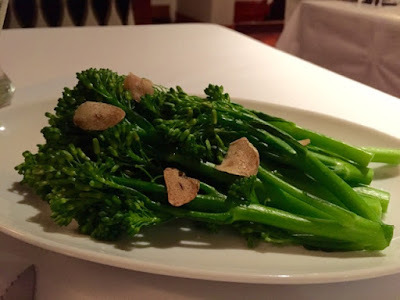 We ordered the steamed broccolini ($6.00) for an additional side and to round out our meal. It came with shaved garlic chips. Steamed veggies, anywhere, are a hit and miss -- these did not disappoint, as they were still a perfect crisp, but not underdone. 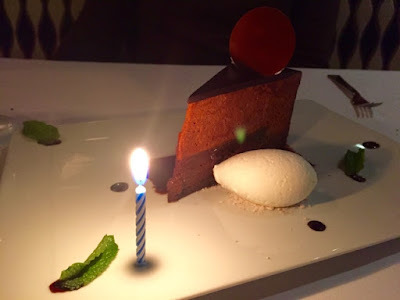 For our anniversary dessert, they gave us a complimentary chocolate cake with vanilla bean ice cream. They were so sweet to do that for us. Once we received our check, we were served these two cute white chocolate truffles. 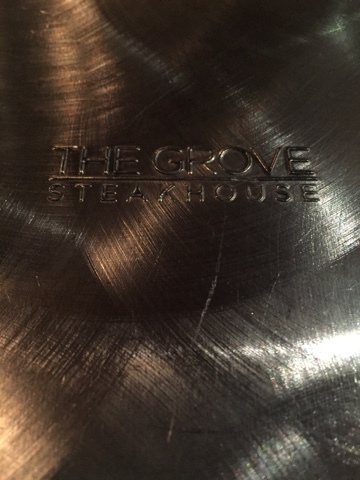 They were the perfect end to the a great night to celebrate our nine years with M. Between the bread, sides and the filet, I did not miss the rib eye at all. I did not feel overstuffed and I had my craving for steak frites satisfied. 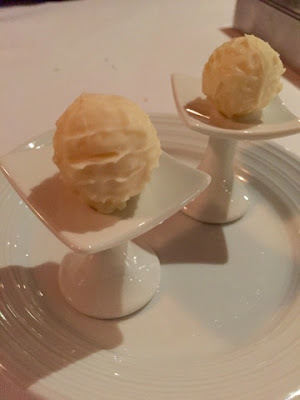 So far, the Grove Steakhouse at the Viejas Casino is our new favorite casino steakhouse, not only for their fabulous food, for for their diamond customer service and little surprises (amuse bouche, the palate cleanser, and the truffles at the end). Also, like most casinos, if you have a players card, there is a dining discount. For us, it was 20% off (not on alcoholic drinks, though). It was a very nice and romantic celebration for the hubby and I! Ooo, the spreads with your bread look delicious. Love the color on the tomato spread, too! It looks so vibrant. Carrot puree is an interesting way to serve carrots… haven’t seen that before! Truffle fries are the best, if you ask me. 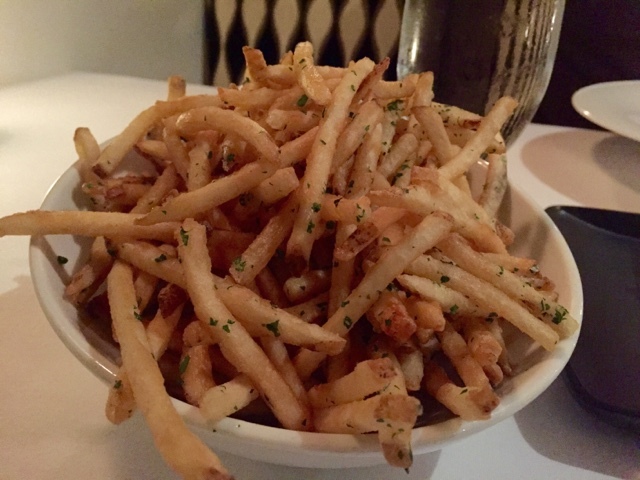 If all fries could have a little truffle oil the world would be a little more heavenly. That’s sweet they had the complimentary cake for you PLUS the truffles! That’s a nice way to end a sweet anniversary dinner! Haha, so true about truffle fries. These were sooo delicious and ranked pretty close to the Terra's in El Cajon. 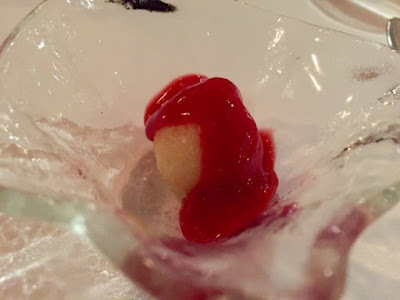 The service and food was really amazing here -- you and Jake have to go!